When I was growing up, my father was a constant source of random musical lyrics. My favourite kind of apple for a while was a Granny Smith, so after lunch, I’d ask (rather innocuously) if someone could pass me a green apple. Invariably, my dad would burst into song: “God didn’t make the little green apples / And it don’t rain in Minneanapolis / In the summertime” and I would get frustrated and teenagerish (UGH! I just wanted an apple, not a concert, DAD.) I’m not sure if he’s still serenading my mother at the supper table, but when I was growing up, he was a constant source of melodies, related (or just as often unrelated) to what was going on. One of my favourites was “Eight foot two, solid blue, / Ten transistors in each shoe / Has anybody seen my / My supersonic cutie-pie / Has anybody seen my girl?” (Lyrics pulled from the recesses of my memory, so probably not accurate). These songs were often accompanied by finger drumming on the kitchen table (rat-a-tat-tat!). It turns out that we’re a household of melodies, too. Duncan taught Owen a swimming song for bathtime, which he now sings nightly: “Swimming, Swimming, in the swimming hole / When days are hot, when days are cold / In the swimming hole! / Front stroke, back stroke, fancy diving too / Oh don’t you wish you never had / Anything else to do, but / Swimming, swimming…[etc]” Then, at the end of his bath every night, we ask Owen to “Get up, stand up (woo hoo!) / Stand up for your rights/ Get up stand up (woo hoo!) / Don’t give up the fight” and Owen supplies any words we leave out. If singing doesn’t work, we unplug the tub and tell him he’d better get out or he might go down the drain. That works too. …And now it will be stuck in your head all week. Our go-to song right now is Bing Crosby and the Andrews Sisters singing “Life is So Peculiar” from the movie Mr Music. Full disclosure: I love Bing Crosby. I started playing his Christmas album White Christmas in early November and had to force myself to put it away at the end of January. 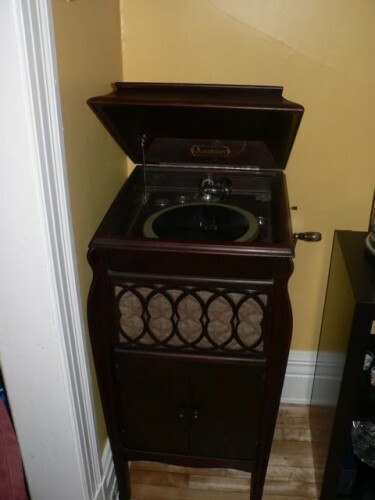 The actual collection of music we have for the Victrola is pretty sparse, but this song sounds better on our old, wind up gramophone than it does digitally. The sound literally transports you. It’s faster when we play it, too, so infectiously danceable. The lyrics are 50s silly: “When I get up in the morning, there’s nothing to breathe but air / When I look in the mirror, there’s nothing to comb but hair [at this point, Owen points to his hair]. When I sit down to breakfast, there’s nothing to eat but food / Life is so peculiar, but you can’t stay home and brood.” What the song stresses, though, is the predictable, and not the peculiar. I was teaching Thornton Wilder’s Our Town this week, not my favourite play, but certainly one that made me think. The most important message in the play is that human beings never “realize life while they live it,” and while the play’s version of daily life is lamented, the truth is (I think) that much (most) of life is trivial and banal and repetitive. On the other hand, you can’t only live for the exciting moments, but sometimes have to wait for the magical to appear out of the everyday. I confess that I have spent too much of my time with Owen waiting for time to pass so that I can get on with the next task I am trying to accomplish. I had to keep him home from daycare on Monday and the morning stretched ahead of me like some looming wasteland I had to get through. We had a lovely day together, in the end, but that morning was LONG. Teaching a four-hour class (or two two-hour classes back-to back) passes in the blink on an eye by comparison. I get physically tired teaching (and today lost my voice), but mentally, I am active and so don’t get bored. With Owen, I run out of mental resources. I don’t have enough ideas of what to do with a 20-month-old, and so many of his games require my active participation that I, quite frankly, get bored. And when I do get interested (in building elaborate train tracks or tall towers out of blocks) I sometimes have to remind myself that I’m playing for him, so when he starts taking my train tracks apart and putting them away, it’s his game, not mine. My point, though, is that over the course of the day, Monday, I realised that I was having a really great day at home with my boy, but it had taken me time to relax into it. I tried to balance getting things done (like shovelling out the 30 cm of snow that had and was still falling) and surrendering to Owen’s whims (dancing for as long as he wanted or letting him tear the stickers in his colouring book. Because it’s his colouring book, not mine, and if moving the stickers around brings him joy, I should just relax). 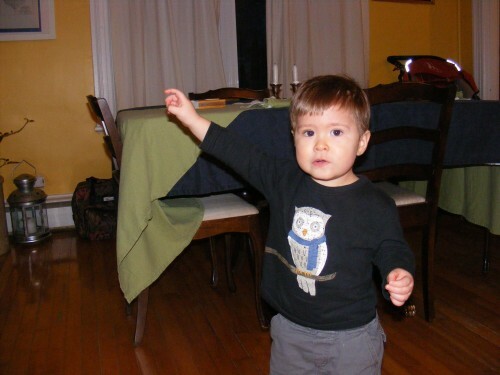 For a couple of weeks now, Owen has been dancing. Every time he hears music, he starts to head-bop. He has a little fridge farm (a great birthday gift… thanks Rebecca!) and he goes over to it every morning to play some tunes. And bop-de-bop. When the music comes on before the news, he bops. When the lead-in to As It Happens comes on, he bops. It’s amazing. It seems like he feels compelled to move to the beat, no matter what he’s doing. I was feeding him yogurt tonight and he took off when the radio played a song, spoon still in his mouth, his head moving back and forth to the beat (more or less). I don’t know if we taught him this, but he also does a version of jazz hands. This is funniest in the car, because the moment a song comes on the radio, you can look back in the rear-view mirror, and there’s Owen with his hands in the air, head bopping away. I wonder whether moving to music is ingrained in us or whether we learn it? I can’t tell whether Owen is dancing because he likes to dance or whether he’s a little monkey doing tricks because his parents seem to like it so much. Either way, it’s pretty adorable. I heard the Train Song on Stuart McLean’s Vinyl Café on Mother’s Day last week. 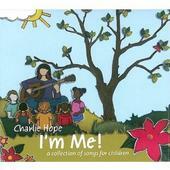 Charlie Hope is my new favourite singer. Duncan bought her CD “I’m Me” yesterday and I can’t stop listening to it. It’s a children’s album, but it is soooo beautiful, and some songs are ageless (especially the Train Song). Her voice is young and light and fresh. Also, her frogs try to eat edamame before being reprimanded and resuming their ordinary diet of flies.